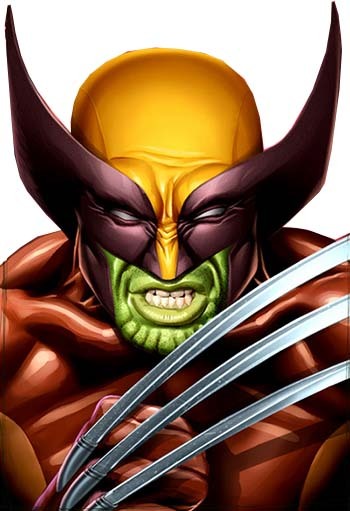 Other Names: Skrull Wolverine; Skrullverine; "James Howlett"; "Logan"
First Appearance: The Uncanny X-Men (vol. 1) #371 (Aug. 1999): "Crossed Wires"
A Skrull agent assumed the form of Wolverine and passed himself off as the mutant hero for a considerable time. The Skrull Wolverine's subterfuge was finally discovered when he was killed. Ironically enough, the Skrull Wolverine was killed by the Horseman of Apocalpyse known as Death, who at that time was none other than the real Wolverine (brainwashed by Apocalypse). The Astonishing X-Men (vol. 2) #1 (Sep. 1999): "Call to Arms!" The Astonishing X-Men (vol. 2) #2 (Oct. 1999): "The Trouble with Mannites"
The Astonishing X-Men (vol. 2) #3 (Nov. 1999): "In the Shadow of Death!" The Uncanny X-Men (vol. 1) #371 (Aug. 1999): "Crossed Wires"